I wrote this piece as a press release for an exhibition to be held at the Australasian Quilt Convention in Melbourne. Since it was not used I thought it might make a good blog entry. I will add a report on the exhibition later in the day with some photographs. The exhibition was called 'Stitch Like an Egyptian'. Barb Zuweilah towers above you, tall caramel stone minarets cutting into a blue sky. It is the gate of the old city of Cairo, built in the tenth century, one of several Southern Gates in the old city wall and the only one remaining today. Tucked underneath, one an a half metres wide and twice as long, is the shop of one of the tentmakers. He is usually called Dendon. It is not his name. He likes turkey, and this means turkey. He is dark, slim, in his fifties and elegant with silvery hair. He sits cross legged on a small bench stitching at incredible appliqué work. As he sews he cuts back excess fabric, and turns under the edges. His hands stitch so fast that it is hard to photograph, just a blur of movement. He is working on a complex design, with twisting trails of colour, ultramarine, cobalt, crimson, gold and turquoise winding under and over each other on a black background. 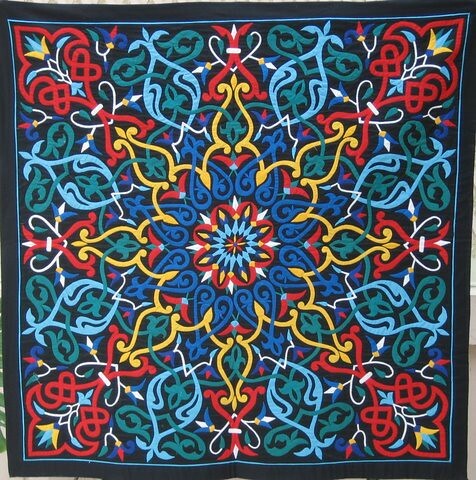 It is reminiscent of Celtic appliqué and knotting, but radiating from a central point and undoubtedly Islamic. Above our heads is his main area, both workroom and storeroom and shop. From the outside the upstairs is remarkable as a beautiful example of an old meshrabieh – the latticed and decorative window that allowed women in past centuries to see out without being seen. When in this room at night the green light from the mosque beside us washes everything across every surface, an underwater room which is covered on every available space of the white plaster walls with decorative hangings. 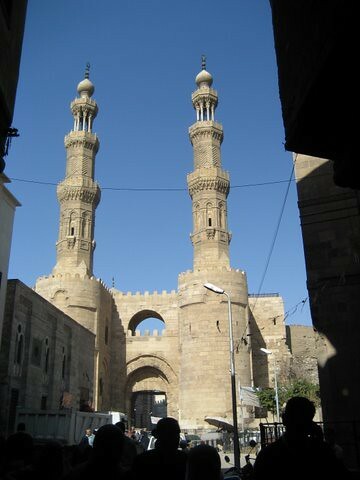 Dendon is one of a slowly disappearing group – the tentmakers of Old Islamic Cairo. There are perhaps forty of the older stitchers left. Younger ones are being trained but the work is hard and slow and wearying, and the money is small so the drop out rate is high. This is a country where hand work is not well paid or greatly respected. The spectacular work of old – the great linings for Ramadan tents and for funerals and weddings and other celebrations has largely been replaced with printed fabric which passes for the same thing – at a distance. 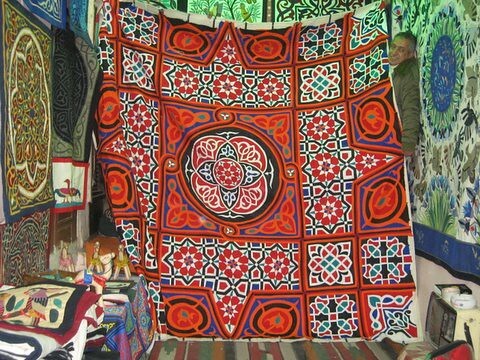 This is an original piece in the photograph above, but all the Khan sells the copy fabric, tentmakers included as it is one way to eke out a small living. The connection to funerals has also made the work unpopular for modern Egyptians with the nagging superstition that it must be bad luck to bring work that has a connection with funerals into a house. 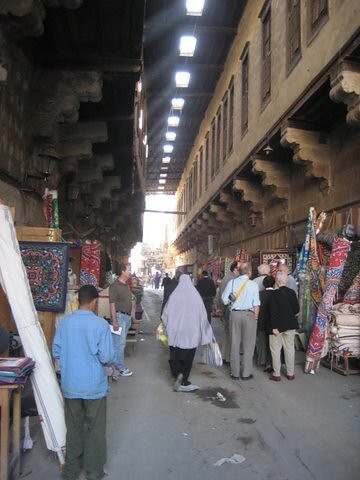 The market nowadays is almost all tourism, though few tourists make it to the Khan Khayamiya. Khan Khayamiya – the Khan of the Tentmakers – stretches opposite Bab Zuweilah. Pass the ful medamas (broad bean porridge) seller with his brightly decorated cart and the heavy whiff of spices and garlic and green onion. Skirt the mud that is in the centre of the road and dodge around the man who sells ducks and chickens and rabbits standing on top of their cages. Step in to the cool of the undercover area. This is the only remaining place in Old Cairo that still has the original covering over the street. The sun slants in dusty fingers through the clerestory openings, lighting occasional doorways. While the street is not busy an occasional donkey cart or truck forces it way through, and good natured people step aside to make room in the narrow street. All down the sides of the streets are the tentmakers shops. Brightly coloured hangings cover the walls and hang outside the doors, and stitchers sit and sew in every shop. One younger man told me sadly that he had stopped stitching because his knees could not take the work. It seemed so strange that knees could be a part of the stitching process, but the traditional way to work is cross legged. Dendon's cousin Ahmed Soliman works around the corner, off the main street. His son has a small shop in the Khan and his work covers the walls here. 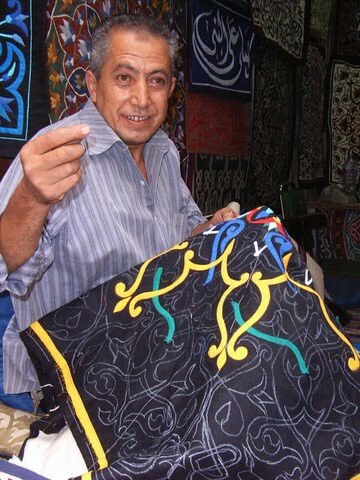 He and his nephew Ayman are happy and excited as they are coming to Melbourne with an exhibition of Tentmakers' work for the Australasian Quilt Convention. Ahmed is another of the older stitchers. He has no English and his nephew will translate for him as he stitches in the exhibition space at the conference. Centamin Egypt, Emirates Airline, Expertise Events and Madame Tricot with pay the costs of their fares and accommodation and food, as these are poor men. The work on the walls in Khan Khayamiya is entrancing. Bright or subdued, Islamic in style, Pharaonic, or street scenes of traditional Egyptian life, large enough to cover a bed or small enough to cover a cushion, it entices and invites along with the constant entreaties from the sellers. This is not an area where you will see tourists. They are well away, three blocks away in the Khan El Khalily. Many of these sellers will have a friend there who will exhibit their work – for a fee – but this is where the real action is. Move into a shop and talk to one of the sellers or stitchers. They are happy to show you what they do, and this is not an area for hard selling, like the Khan El Khalily. Stay a little longer and you will be offered tea – or Khakadeh – the hot and spicy hibiscus tea so loved by Egyptians. I can think of few things better than to sit in one of these shops watching the world go by and sipping hot tea, watching the flying fingers stitching down bright colours on a soft cotton ground. Come and see their work in Melbourne. It may be as close as you will get to Khan Khayamiya. Brilliant Mum, well done again! I've been checking the blog every couple of days for a new post. Nice to see I found it before you told the family! What's the next one going to be on? Or have you found one of those rare moments to work on the next big quilt??? Love, FBS. I'm such an armchair traveller that I may never get there, but at least I can get stories and pictures like this. It was nice to meet you at Symposium, Jenny, though you probably don't remember me from amongst all the other tutors. Best part of the Khan...loved this post. Wow, that was truly interesting. Thanks for sharing. Okay, that's a must-see. Fancy the knees being a problem as you say - no chance of moving up to a very low weight-bearing stool? Wow, wonderful post - felt like I was really there. I never can get enough of the Tentmaker's work. I loved all the pictures of Tonya's when she went to Tentmaker street and I am the lucky owner of one of them Tonya picked up for me! It is a treasure for sure!